When you dine at the Mid City Grill, you’re not just getting a meal—you’re getting a culinary experience. Our dishes are carefully crafted by a team of dedicated chefs, using only quality ingredients. The result is food that is flavourful, diverse, beautifully plated, and served with a smile in a relaxing restaurant atmosphere. 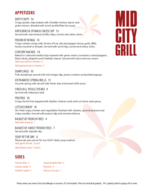 The Mid City Grill also offers a variety of daily and weekly specials at unbelievable prices, making it perfect for every occasion. Plus, the monthly feature menu ensures that dining at Century Calgary is different each and every time. Try your new favourite meal today! Grab a refreshing drink and enjoy a great selection of snacks and dishes at the Infinity Bar. Located conveniently on the slots floor, this is a great place to catch your favourite sport or take a quick break from the action. Betting on the horses? You can bet you won't have to go far to get your next drink! Head on over to the OTB bar where we offer beers, cocktails, and more. Put the ‘special’ in your next occasion. Century Casino Calgary offers three unique spaces that are perfect for birthday parties, conferences, team-building events, anniversaries, weddings and more! Suitable for up to 150 guests, this space is equipped with state-of-the-art audio-visual equipment, a projector and stage, a dance floor, a fully-licensed private bar, and extensive catering options. Enjoy the unique atmosphere while arranging the room to suit your event's needs. For smaller parties, the Winners’ Lounge is suitable for up to 30 guests and includes a dance floor, lighting, and catering options. Want something really special? Ask us about a party room in Century Sports! With close access to mini golf, bowling, and arcade games, you're just a step away from the fun! Inquire about your next event and let our events team take care of the rest. Dig in to fantastic food specials, available only to our Winners' Zone members! The Mid City Grill offers daily lunch specials and dinner specials from Sunday to Thursday, including our famous $4.99 breakfast and $8.99 prime rib. New specials are always coming to Century Calgary, so be sure to keep up to date on our latest promotions!